I am not a Utilitarian, when it comes to moral philosophy. And I am not into celebrities. Nevertheless, I was looking forward to “meet” Jeremy Bentham, the father of Utilitarianism, who is currently in visit at the Met-Breuer museum in New York City. To be precise, of course, it is Bentham’s famous “auto-icon” that is visiting, as part of the fascinating “Like Life: Sculpture, Color, and the Body” exhibit, which has just opened and will go on until July 22nd. The auto-icon is made of the preserved remains of Bentham, dressed with his own clothes and sporting his favorite cane, which he nicknamed “Dapple.” The head is actually a very realistic wax replica based on portraits from the time, as the actual one did not fare well during the chemical process that Bentham instructed his friend and physician Thomas Southwood Smith, to carry out for preservation purposes. It is currently exhibited where the auto-icon normally resides, at University College London, looking rather ghastly, I’m told. Bentham came up with this strange idea for a number of reasons. For one thing, he wanted to stick it to the Church of England, which at the time (he died in 1832) still had a monopoly on dead people. Bentham, who was a stunningly progressive man for his culture, thought the church was “irredeemably corrupt.” The second reason was so that his body could be dissected for medical research (by his friend Smith). At the time medical doctors had little available material for the purpose, mostly a few hanged criminals, courtesy of the Crown. Lastly, and most importantly, he had a vision of setting an example, ideally leading others to do the same, getting some utility from their bodies. He explained what he meant in his last essay, entitled “Auto-Icon; or, farther uses of the dead to the living” (you can read it here). He wrote that “[Just as] instruction has been given to make ‘every man his own broker,’ or ‘every man his own lawyer’: so now may every man be his own statue,” envisioning auto-icons being waterproofed and dispersed among trees on people’s estates, kept as decoration, or even used as “actors” in historical theater and debates. I guess it did not occur to him that the most natural and probably useful way to get some “utility” from our dead bodies is to let them naturally decay (e.g., inside biodegradable coffins), thus slowly rejoining the cosmic cycles. Needless to say, Bentham’s vision did not take hold, and people are still buried in expensive coffins that actually postpone the natural recycling process, though an increasing number of people now opts for cremation. Of course, that wasn’t the only idea he put forth that did not pan out. His most famous contribution to philosophy, the first version of Utilitarianism, was so badly flawed that his follower and student John Stuart Mill immediately had to propose major modifications. I guess I’ve got a good excuse not to go to the gym this morning, then. It’s painful, not pleasurable, to me… Bentham’s principle puts his philosophy squarely in the realm of psychological egoism, rarely endorsed by philosophers of any time or place, one of the few exceptions being Thomas Hobbes, of all people. (This is not to be confused with the so-called “rational” egoism of Ayn Rand, by the way.) The problem with Bentham’s version of Utilitarianism is that it inevitably leads to a sort of minimum common denominator of human actions. It defines, for instance, certain actions as immoral because they cause us pain, even though such actions (say, sacrificing us for the good of another) would appear to be moral under most other frameworks. Moreover, if pleasure is all there is to happiness, it is hard to see why we shouldn’t all hook ourselves up to a pleasure machine and be done with it. Of course things are much, much more complex than this, and interested readers will find an in-depth discussion of Mill’s version of Utilitarianism, and of his critique of Bentham, in this article from the Stanford Encyclopedia of Philosophy. Rather, I took Jeremy and many of the other works exhibited on the two floors that hosted “Like Life” as a memento mori: artistic reminders of what Seneca called the ultimate test of our character, because, in reality, we die (a little) every day, and have our whole lives to prepare for the final exit. Too often, especially in the United States, we are in denial of the ultimate natural phenomenon that affects all the biological world. We don’t talk about death; we try to stay away from the corpses of people who died, even when they belonged to our loved ones; we speak of death by way of euphemisms, as in “he passed away”; and some among us even dream of immortality through likely impossible new technologies such as mind uploading (which, conveniently, are always a few decades away). This entry was posted in Aesthetics on March 27, 2018 by Massimo. Does the Mona Lisa smile? I spent the weekend in Ghent, Belgium, where I participated to an event called Night of the Freethinker. After giving my usual talk on Stoicism as secular philosophy (slides here), I took part in a debate on post-truth and the nature of science, together with my friend Maarten Boudry (co-editor of our forthcoming Science Unlimited? The Challenges of Scientism) and local author Coen Simon, the whole thing ably moderated by Eveline Groot. 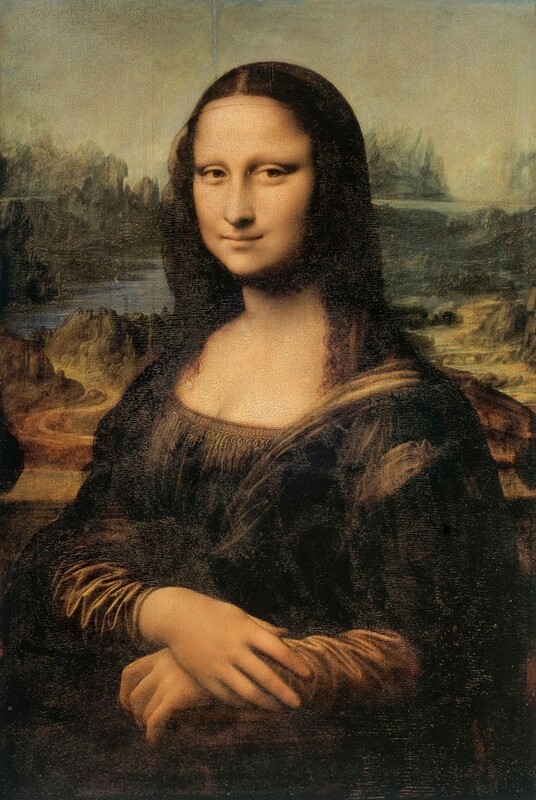 At some point, Eveline put up a slide of the Mona Lisa, Leonardo da Vinci’s famous masterpiece, challenging the panel to comment on recent “scientific findings” that allegedly settle, once and for all, the question of whether the Mona Lisa — a portrait of Lisa Gherardini — is actually smiling. Setting aside obvious flaws and limitations in the study — like the culturally homogeneous, very small sample size, and the confounding effect that it’s going to be hard to find a person in Western Europe who has never before been exposed to pictures of the painting — Liaci et al. very clearly did not settle the question they set out to settle. (The authors did uncover some interesting findings, though, like the fact that people interpret faces as more or less sad depending on context.) If the question is “does the Mona Lisa smile,” an opinion survey among people with no background in art history is entirely pointless. It only tells us how many regular folks perceive the Mona Lisa as smiling, but that’s clearly a different question. One could ask art historians and Leonardo experts instead, and learn a thing or two about how smiles and facial expressions were painted by the Italian Master and his contemporaries and immediate predecessors during the Renaissance. That would be far better ground to ascertain whether Leonardo himself meant his portrait to represent a smile or not. But in fact we have access to a copious direct source of evidence: the notes and drawings of the artist, as summarized for instance in a recent book by Walter Isaacson. The irony of attempting to “scientifically” answer a question to which everyone already knows the answer is that Leonardo’s own art was heavily informed by his scientific studies, in the true fashion of a Renaissance Man. The Last Supper, for instance, is the result of Leonardo’s studies in optics, while his deep understanding of human anatomy is in stark display in St. Jerome in the Wilderness. The Mona Lisa was worked on by Leonardo during the last 16 years of his life, a period during which he also did dissections of cadavers to study facial expressions and their connection with human emotions. His near contemporary, Giorgio Vasari, says that “while painting [Donna Gherardini’s] portrait, he employed people to play and sing for her, and jesters to keep her merry, to put an end to the melancholy that painters often succeed in giving to their portraits.” But while Vasari attributes the result to superhuman skills originating directly from God, it was Leonardo’s genius for both art and science that gave us this magnificent example of human creativity. Art historians know — as retold in detail by Isaacson — how Leonardo meticulously prepared the paint for the Mona Lisa, laying down an undercoat that would help create an almost tridimensional feeling for the viewer. Some paint was applied in very thin layers, over a period of years, with degrees of thickness as small as 2-5 micrometers. The way the paint is stratified and applied makes it look like the subject’s gaze is following us around the room (try it out, if you happen to be at the Louvre and you can manage to be near the painting for more than a few seconds, it is uncanny). We learn the most about the famous smile by reading Leonardo’s notebooks during the time he spent dissecting bodies at the hospital of Santa Maria Nuova, in Florence. He wrote: “The spinal cord is the source of the nerves that give voluntary movement to the limbs. … The muscles which move the lips are more numerous in man than in any other animal. One will always find as many muscles as there are positions of the lips and many more that serve to undo these positions.” Next to one of his many drawings of faces he added: “Represent all the causes of motion possessed by the skin, flesh and muscles of the face and see if these muscles receive their motion from nerves which come from the brain or not.” He even carried out comparative anatomical studies of the face muscles of horses, which are larger and easier to dissect. 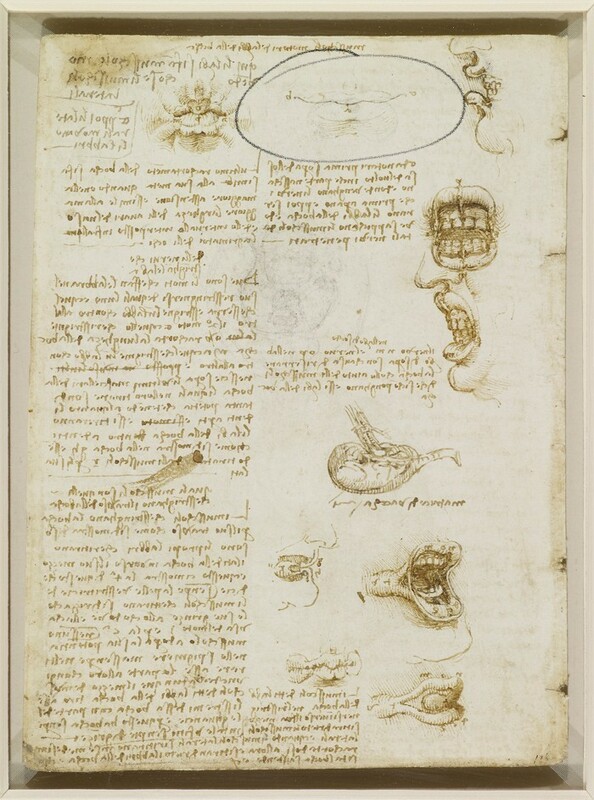 Next to it, Leonardo wrote: “Make the nostrils drawn up, causing furrows in the side of the nose, and the lips arched to disclose the upper teeth, with the teeth parted in order to shriek lamentations. … The maximum shortening of the mouth is equal to half its maximum extension, and it is equal to the greatest width of the nostrils of the nose and to the interval between the ducts of the eye.” Now look closer to the drawing I circled in the upper center of the figure. It’s a smile, very much reminiscent of the one he later developed for the Mona Lisa. Now compare this nuanced qualitative description of Leonardo’s work, informed by historical findings and knowledge of the cultural milieu the artist was working in, with the “scientific” study of a dozen random Germans’ opinions about what counts as a smile. Tell me which way you learned the most about the Mona Lisa. Then, if possible, go take another look at the painting the next time you are in Paris. Or make a point of going to see it. This entry was posted in Aesthetics on November 20, 2017 by Massimo. Is love possible across multiple worlds? Does True Love (TM) exist, metaphysically speaking? These and other fun questions are addressed by Mike LaBossiere in an article that is as much fun to read as it is an example of how philosophy — particularly metaphysics — can seriously miss the point when it comes to crucial aspects of our lives. Let me explain by way of a story concerning one of my favorite superheroes, the Flash. In season 2, episode 13 of the television series, entitled “Welcome to Earth-2,” Flash — the fastest man on Earth (one) — travels to a parallel Earth in order to figure out how to defeat the supervillain of the season, a guy named Zoom. It doesn’t matter why all this is happening, what matters is that Flash, known to the world as Barry Allen, meets the doppelgänger of the love of his life, Iris West. Barry-1 is perfectly aware that he is in the presence of Iris-2, who is a parallel version of the woman he loves, not the “real” thing. And yet, he simply can’t avoid having the same feelings for Iris-2 that he has for Iris-1 back on Earth Prime. LaBossiere’s article explores the metaphysics of this situation, considering two possibilities: (i) it is rational for Barry-1 to be in love with Iris-2, on the grounds that Iris-2 is, for all effective purposes, the same woman he fell in love with on Earth-1, meaning that she looks the same, has the same interests, sense of humor, way of speaking, and so forth. Love, in this scenario, is fungible. Or: (ii) it is not rational for Barry-1 to be in love with Iris-2 for the reason that she is not his True Love, even though she looks and acts like it. LaBossiere defends position (i), pointing out that (ii) stems from a metaphysically Kantian, and highly doubtful, view of the self. I will argue that the real answer is indeed close to LaBossiere’s, but that it makes more sense to arrive at it by way of a very different route. Indeed, this has already been done by one of my favorite philosopher-comedians: Tim Minchin. Let’s parse this out carefully. I’m going to start from option (ii), the “Kantian” view. As LaBossiere is careful to point out, Kant never actually wrote about True Love. But he famously did reject David Hume’s view of the self as just a “bundle of perceptions,” thinking instead that our experiences happen to a unified, metaphysically “thick,” self. A metaphysical self is necessary in order to talk about True Love, the sort of love that Barry Allen can feel only for Iris West-1, and not for her doppelgänger. This is because if Kant is right, and there is such thing as a metaphysical self, then each of us has one and only one self, and anyone who merely looks or talks like us is still (metaphysically) quite distinct from us. One way to make sense of this position is to imagine meeting for the first time your loved one’s twin. You might naturally feel attracted by her, especially if the twin has no only the looks, but also the opinions and mannerisms of your love. But, according to LaBossiere’s interpretation of Kant, you would be mistaken: regardless of superficial similarities, the twin is metaphysically, at her core, simply not your love. If that is the case, let us then consider option (i): love is fungible, as they say. It makes sense to be in love with anyone who shares a substantial number of physical and mental characteristics with your original love, other things being equal. Here LaBossiere helps himself to the idea of parallel universes, in effect arguing that what Barry Allen finds attractive in, and the reason he falls in love with, Iris West, is just the sum total of Iris’ characteristics, from her physical appearance to her interests, from her mental abilities to her moral character. If this is true, it follows that it is perfectly reasonable for Barry to be in love not just with Iris-1, but with any Iris from any of the infinite parallel Earths (so long as, I suppose, their individual life trajectories don’t actually lead them to become adult human beings that are significantly different in some crucial respect from Iris-1). LaBossiere’s conclusion strikes me as fundamentally correct, but it is also an example of what Italians sarcastically refer to as the Ufficio Complicazioni Affari Semplici (Office for the Complication of Simple Affairs). I mean, sure, one can invoke the multiverse to make the point, or — far more simply — one can do like the above mentioned Tim Minchin, and simply look at the issue from the point of view of basic statistics and biological-cultural diversity among human beings. You get the gist. Minchin has simply and straightforwardly gotten rid of the “Kantian” idea of True Love, as well as endorsed LaBossiere’s point about the fungibility of real love. All without the need for any metaphysical heavy lifting (assuming that metaphysics can, in fact, do any lifting at all). A simple understanding of how life works, a basic appreciation of probability theory, and a good sense of humor will do just fine. This entry was posted in Aesthetics, Metaphysics, Social & Political Philosophy on October 2, 2017 by Massimo. Recently Dan Kaufman and I have had another of our recurrent conversations, this time a second installment of an occasional series that we might call “philosophers who influenced us” (the previous one featured Bertrand Russell, on my part, and Gilbert Ryle for Dan). This time I picked David Hume, the empiricist and skeptic who famously awoke Kant from his “dogmatic slumber,” and who — I think — is still not appreciated as much as he should be for his impact not just on subsequent philosophy (including epistemology, ethics and aesthetics), but on science as well. Dan’s pick was the philosopher of aesthetic and highly impactful critic of art Arthur Danto, who developed one of the most recent and compelling theories of art to date. This entry was posted in Aesthetics, Epistemology, Ethics, Sophia Videos on September 26, 2016 by Massimo.